After my alloo methi sprouthi sprouts stir fry was a hit, I followed a friend Balvinder Kaur's idea of using fenugreek sprouts with pumpkin to make kaddu methi sprouts stir fry. I loved the recipe, which was liked by hubby as well. So I tried to replace pumpkin with lauki, ghiya, or bottle gourd, which is hated by most young members in Indian households. I must say this is one of the yummiest lauki recipes ever. Undoubtedly, this is the best way to serve lauki to your family. The humble bottle gourd is rich in nutrients, vitamins, minerals and full of easily digestible fiber. It is useful in weight loss, lowering your blood pressure levels, and keeping heart healthy. Bottle gourd has a cooling effect on the body. Since it is available in plenty in summers, so why not increase your intake of lauki in the hot season and enjoy its benefits. It replenishes water loss from your body. Cut lauki into small pieces. 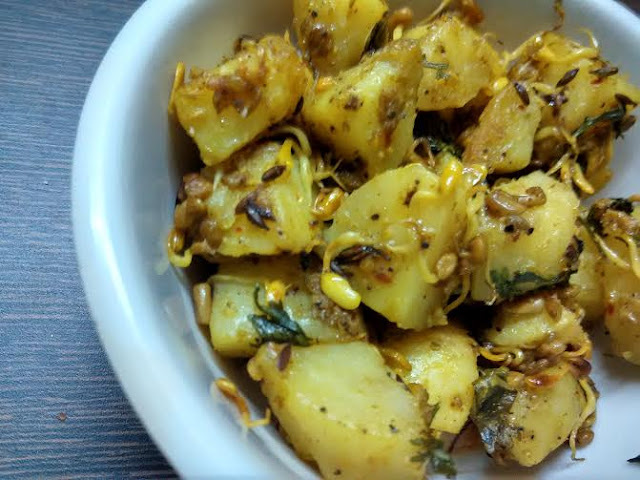 Wash and then marinate lauki and boiled potato pieces with salt, turmeric, and sambar masala. Add the marinated lauki and potato pieces to the oil. Stir fry for a couple of minutes. Sprinkle red chilly powder if you want it spicy. Now add chopped tomato and cook & cover. Keep checking intermittently after 5-8 minutes. The lauki methi sprouts vegetable will be ready in a jiffy! 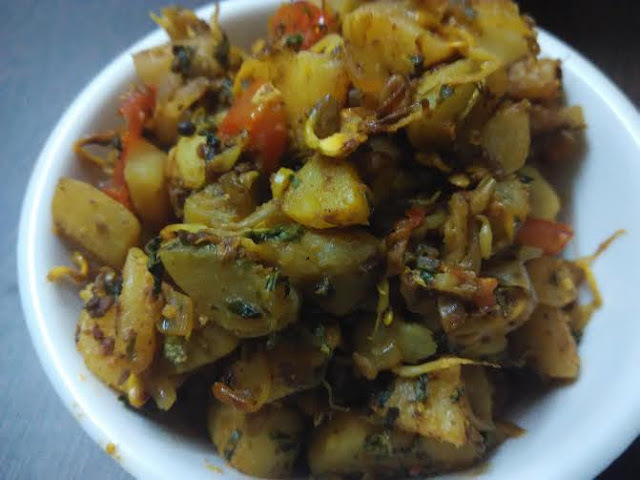 Do not forget to try out another methi sprouts stir fry recipe - here's aloo methi sprouts stir fry. The taste. the aroma, the look of this aloo stir fry reminds me of aloo methi sabzi that we usually relish in winters. This methi sprouts stir fry is your best bet to enjoy the same taste during summers.